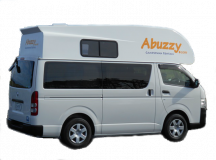 The Abuzzy 2 Berth Ultimate is a luxurious two berth Motorhome, a Fiat design, accommodating two in luxury, with ample space and storage. Features include fixed double bed, a large Kitchen equipped with microwave, grill and 4 burner gas hob. Ducted air heating and full insulation with double glazing ensure you will be cosy as! "Certified as Self Contained" gives you more camping options. 2008 - 2012 models. The Abuzzy 2 Berth Grand is a quality two berth Motorhome. Ford design 2008 - 2012 models, Refurbished to modern with European design and packed with features. The bathroom features a shower separate from the toilet accommodating two in luxury, with ample space and storage. Features include luxury slat king size permanent double bed, a large Kitchen equipped with microwave, grill and 3 burner gas hob. Ducted air heating and full insulation with double glazing ensure you will be cosy as! Toilet canister is a separate tank to the grey water. Is "Certified as Self Contained" which gives you more camping options. The Abuzzy 6 Berth is a modern quality Motorhome with European design and packed with features: six berth Motorhome, a top Ford design, accommodating five people (six seat belts) with ample space and storage. 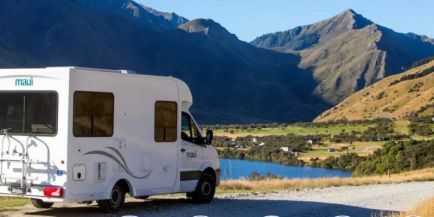 Certified Self-Contained which gives more camping options. 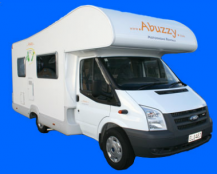 Quality campervan models 2008 to 2012 refurbished to modern European design. 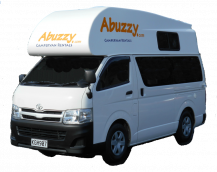 The Abuzzy 3 berth Top is fuel efficient and self-contained. Has seats for up to 3 adults and choice for sleeping as 2 double beds (over drivers cab and convertible dinette area), is of a modern design and packed with features. The bathroom features a fully functioning flush toilet. Other features include certified for freedom camping and solar power. All kitchen cooking and eating equipment standard. Certified self-containedso gives you more camping options. This vehicle is 2013 to 2016 with 2017 fit out.